Every user owns one datastore of every type. Currently there are 3 types. The password datastore, the user datastore and the settings datastore. 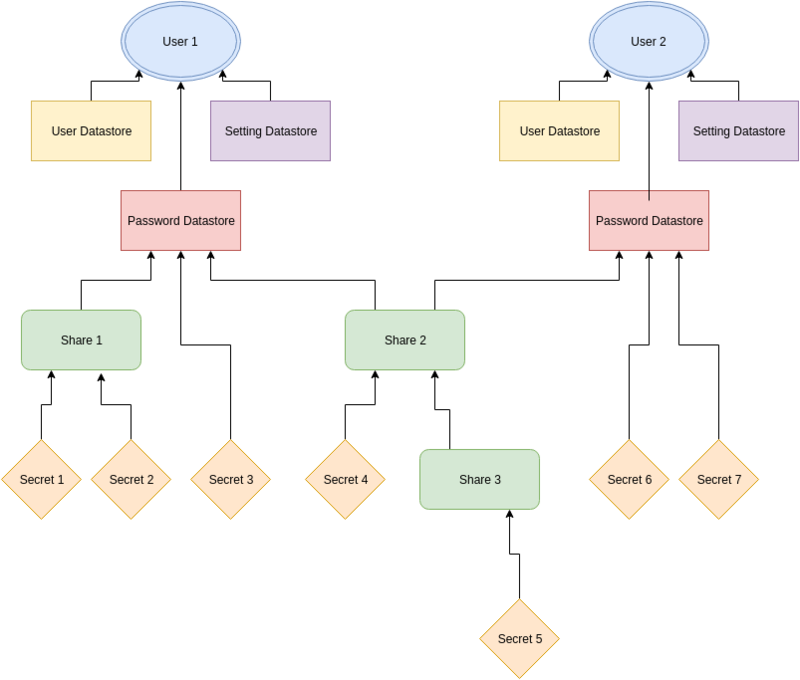 Every datastore is encrypted with a unique symmetric key, that is stored symmetric encrypted by the users secret_key on the server. The settings datastore contains the basic settings of the user, like e.g. his defaults to generate a passwords. The user datastore contains the user details of other users, that he added as “trusted” users, especially the public_key of the other user. Every secret is encrytped with a unique symmetric key, that is stored in plain text in the parent object (either datastore or share) that links to the secret. The server keeps track of the location of the secrets with the “Secret Link” Model. Shares are the base object that is created whenever a user wants to share anything with another user. They can contain a complete filestructures, similar to a datastore (described in the Datastore Structure Documentation) with links to secrets. The main difference in comparison to datastores is that shares can be accessed by multiple users, based on their access rights. Every share is encrytped with a unique symmetric key, that is stored in plain text in the parent object (either datastore or share) that links to the share. The server keeps track of the Share structure in the “Share Tree” Model. Two users, each of them owning their three datastores. The password Datastores can link multiple shares and multiple secrets. One share can link multiple other shares and multiple other secrets. Every datastore is owned by exactly one user. That user has full access privileges and can create, delete, modify it as he / she wants. Every share has a defined set of permissions for every user (“User Share Right”) and group (“Group Share Right”). Grant: Allows the user / group to modify the access permissions (including his own) and share it with other users / groups. “Direct permissions” beat “inherited permissions”. If a user has “direct permissions” that do not allow “write” on “Share 2”, then inheritance wise, he would also not have “write” permissions on “Share 3”. But. If someone gave him direct permissions on “Share 3” to write, then he can write. This works also for removing permissions. “Deleting” a share does not actually delete a share. It only removes the link from the parent to the share. Access to secrets is based on the permissions on the entity (datastore or share) where they reside.